After listening to the 2003 Danger album, I was really curious to see what this 3rd full length album of Swedish melodic metallers had to offer. Danger was a good piece of melodic metal with traces of speed, prog or even some AOR but my distinctive feeling was that the band was still trying to find its own style, trying to set their mark on this already crowded genre. That’s why I was really anxious to see the direction they took with their latest opus. The style is definitely melodic metal, the most significant (and benefic) change lies in the fact that the band has geared down a notch, thus allowing the music to develop its own personality. The dual guitar attack and the mid tempo rhythms increased the heaviness of the album, allowed to insert epic or power elements (Dance Of The Elements) and most of all allowed vocalist Joakim Olsson to really shine. The keyboard driven sound of Danger is changed for a more guitar oriented (nevertheless melodic) sound. Once again the album was produced by the excellent Fredrik Nordstrom who did a perfect job at blending all the instruments to create a powerful yet crystal clear sound. Despite the change in the line up (drummer Jocke Unger was replaced by Johan Rydberg), you could really tell that on this album we have a group of very competent musicians that are very comfortable playing together, each of them adding their part in the mix. Tobias Wernersson’s role in the band increased significantly, besides playing lead guitars, he also became one of the main composers together with Chrille Andersson (keyboards) and Daniel Andersson (bass). His playing style is very reminiscent of Blind Guardian’s Andre Olbrich’s, heavy and intense, adjusted to the band’s rhythm. Though his main influence is shown in the Malmsteenesque instrumental The Quest Part 1 or on The Bitter End, he is an accomplished guitarist on his way to create his own style. On this album Chrille’s keyboards took a step back, allowing the guitars to set the pace of the album. Amazingly he is the one who profits the most, free to set the warm atmosphere, to add another layer to the sound, to round up the edges and even set up the pace and engage in a few duels with the two guitarists (King Of Warriors, Die In A Dream). Especially on the last three tracks Chrille’s keys have the aggressive sound of Jens Johansson (Yngwie era). As I mentioned before, the somewhat slower pace allows Joakim Olsson to really display his powerful and emotional voice. On previous albums, he sounded very similar to Toni Kakko, hitting the high notes effortlessly but his force lies in the mid range and he really takes advantage of this. His clear voice fits perfectly the music style and not even once does he sound rushed or out of place. Sometimes sounding like Christian ‘Krille’ Andren (Tad Morose) and even like Volker Walsemann (Poverty’s No Crime), Joakim Olsson is a valuable frontman and his voice really fits the style of the music. The balance between the vocal parts and the instrumental ones is perfect, complementing each other and moving together in the same direction. Another pleasant surprise is the good vibe that you get after listening to the album, despite the fact that most of the songs deal with serious issues- death (Dawn Of The Dead, Die In A Dream, The Bitter End) or revenge (My Revenge). Not exactly what you would have expected from a melo-metal sound, right? Perhaps it’s the strong musicianship showed by this band that makes the listener to appreciate this album to its fullest. 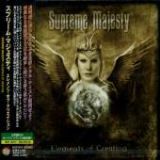 True, in this genre it’s very difficult to earn an “original” title but I think that Supreme Majesty finally found a sound that defines them best and helps them improve as a band. Their latest album shows a good and natural progression from the first two efforts. It is in their power and abilities to become a big name in the metal world and I think that the future looks bright for them.